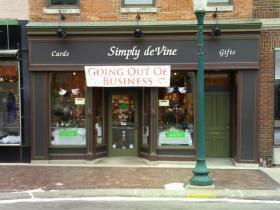 The unique gift items sold inside Simply deVine have always been popular with customers, but they did not generate enough revenue for co-owner Sheila Miller to continue operating the business. She will have to close her doors for good Feb. 28. Jan. 29, 2010 · 12:32 p.m.
On a gloomy winter morning a going out of business sign hangs over the store front of Simply deVine. The inside of the store is much more cheerful than the sign outside. The tables of candles and lotions in the center of the store draw you in immediately. Simply deVine opened its doors in November 2007. The unique gift items sold inside have always been popular with customers, but they did not generate enough revenue for co-owner Sheila Miller to continue operating the business. She will have to close the doors with her husband Samuel for good on Feb. 28. “The main reason why we are having to close is, we think a lot of it is due to the economic climate,” Miller said. “Because we are such a new business it has to have a lot of customers coming in and making purchases. Miller’s story is one the Ypsilanti Downtown Development Authority’s Economic Restructuring Committee wants to avoid. That’s why it is tackling ways to help keep local retail businesses like Simply deVine afloat. In a meeting this month the committee discussed plans to help keep small businesses in the downtown area. By talking with local business owners, the committee hopes to get a better understanding of why stores are closing. The DDA also would like offer a welcome packet to new businesses that come to downtown. The packet will offer information and help for the new business owners, containing economic information to help with planning and contact information for other local business owners. The DDA hopes the packet will give business owners the tools needed to be successful. Miller said she was not offered any such help when she opened up shop. Miller has hopes the DDA will be able to help retail sales in downtown remain profitable in the future. “I think the one thing in Ypsilanti, is people need to get the mindset that there are stores and places to come to shop” Miller said. “For a long time there were not a lot of businesses here, so it’s not rooted in people’s minds. Miller said that economic stability in downtown would be based around cooperation among local business owners in the future.